Condition: Good consistent with age. The fold between the two pages is beginning to tear. Arthur DEAN of Burslem, Staffordshire. Timber Merchant. The last three named are acting as Trustees of the Town and County Permanent Building Society. 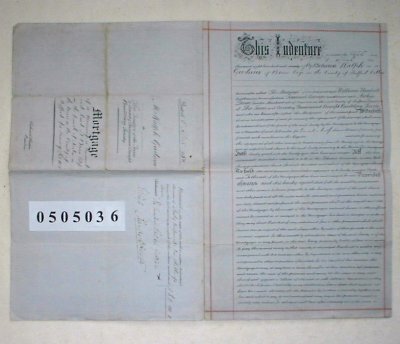 Mortgage of messuage of land at Brown Edge, Parish of Norton. Stafford. £62/10/-d. The summary description of this document is being processed and will appear as soon as possible. If you wish to know details in the meantime, please contact familychest@aol.com by email and we will respond by return.